If you run a tutorial, advise students, front a counter to answer queries, or deliver marks and feedback then you are an emotional labourer. Lecturers attempt to deliver and manage enthusiasm, curiosity, passion, and hope amongst students and colleagues. They may also encourage respect, fear, and even anger about their subjects. In the academic service economy emotional labour may also require academic and support personnel to appease distress, dissatisfaction and complaint. After all, people do talk about emotions in economic terms: emotional cost, expenditure, burden, capital, deficit or investment. In her study into emotion, sociologist Arlie Russell Hochschild took emotional labour as a defining characteristic of work undertaken by anyone responsible for “voice-to-voice or face-to-face” service. The metaphor of emotional labour rings true. When I worked in an architects office designing houses at times we thought of ourselves as providing clients with their dreams and at times we were couples counsellors. Designing a family’s ideal home involves massive emotional investment by client and architect. Emotional labour is just a small part of an architect or lecturer’s role and skill set. But in some jobs it’s key. Hochschild connects with Karl Marx’s characterisation of labour on the production line, where the worker has become subservient to the machine. On a production line labourers have to suppress their own physical freedoms of movement and operate as a compliant instrument of production. What Marx said about physical labour on the production line correlates with labour in the service sector, where workers are required to deliver “service with a smile” whatever the circumstances. Hochschild studied the training and work practices of airline attendants whose emotional investment is palpable. “For the flight attendant, the smiles are a part of her work, a part that requires her to coordinate self and feeling so that the work seems to be effortless. To show that the enjoyment takes effort is to do the job poorly. Similarly, part of the job is to disguise fatigue and irritation, for otherwise the labor would show in an unseemly way, and the product — passenger contentment — would be damaged! Because it is easier to disguise fatigue and irritation if they can be banished altogether, at least for brief periods, this feat calls for emotional labor” (8). Two coffee shops near my office belong to well-known chains. One is adjacent to a bus stop and always has customers. The other is down a side street. It’s popular, but the staff work harder to befriend the customers, guess their regulars’ orders, joke, respond to “thanks” with “you are very welcome,” and of course affect a cheery smile. I assume it’s part of a concerted policy and training. Perhaps being super-pleasant involves remuneration or competition amongst staff, and it’s a criterion in recruitment. Businesses gain a competitive edge, or survive, by affecting friendly service. Hochschild implies that the client-service relationship is prone to inequalities. The pay may be adequate, but doesn’t necessarily take account of the energy expended and the cost to the front-line emotional labourer. Perhaps at least emotional investment should feature in negotiations over pay and conditions. Emotional labour exacts a toll. It makes demands similar to deep or method acting, according to Hochschild, that leaves the actor drained after prolonged performance. In many cases there’s the strain of masking one’s actual feelings. Genuine, heart-felt empathy with customers, patients, those in care, and students spills into the worker’s private life. The emotional worker may even require their own support group to help cope with these stresses. It all costs. the social worker whose look of solicitous concern makes the client feel cared for, the salesman who creates the sense of a ‘hot commodity,’ the bill collector who inspires fear, the funeral parlor director who makes the bereaved feel understood, the minister who creates a sense of protective outreach but even-handed warmth — all of them must confront in some way or another the requirements of emotional labor (11). Hochschild’s book The Managed Heart was first published in 1979, though it was republished in 2012. She references online life in other publications, but the book hasn’t been updated to reflect the transfer to online services. From a Marxist viewpoint we are currently in the final phase in the diminution of the labourer’s autonomy. Physical labourers, knowledge workers and emotional labourers succumb to automation and replacement by the machine — or its prospect. She’s mainly writing about problems on the supply side of emotional labour. Customer frustration at distant, inept and unsympathetic online customer service eventually filters through to service design. Some consumers for some of the time welcome interaction with service providers that don’t inquire how you are and seem to mean it. At the very least, we can say that emotional labour is being reconfigured and adjusted in the online world. Highmore, Ben, and Jenny Bourne Taylor. 2014. Introducing mood work. New Formations 82, 5-12. Hochschild situates emotional labour within the economy of the gift. 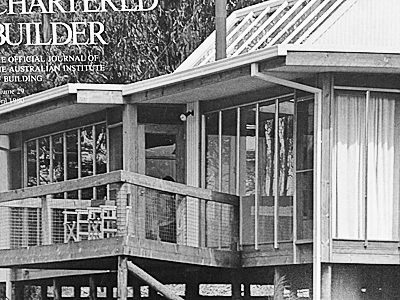 The first image in this post is of a holiday home in Lorne, Victoria (Architect John Castles, project architect Richard Coyne, 1980). The second image is on a flight into Iceland. 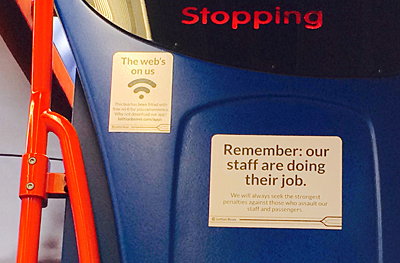 The image below is a sign on an Edinburgh bus reminding passengers that employers have a responsibility to protect staff from verbal and physical abuse. See Anti-social behaviour on buses.